Warning: The following piece of dialogue hasn't been tested on small animals or smaller children. Also, none of the actors in this film stand a hope in hell of winning an Oscar either. Yep. This film. 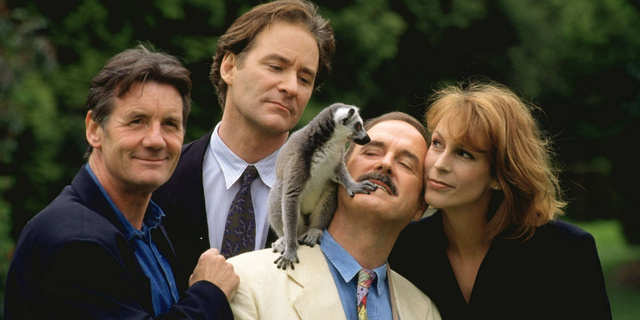 Directed by Fred Schepisi with Robert Young; and Starring: Kevin Kline, John Cleese, Jamie Lee Curtis, with Michael Palin. It was made in 1997, and lasted for 93 minutes. Oh dear. Have you ever never noticed that when the Australian corporate tycoon, Rod McCain (Kevin Kline), buys a new business, he always seems to shake them up rather radically afterwards? Yeah. Just ask one of his employee's, Rollo Lee (John Cleese), and he'll tell you what he urges him to do with a zoo he's recently purchased. For a start, he encourages him to enforce a 'Fierce Animals' policy, just to bump-up the profits a notch or two. And then, when that doesn't go according to plan, Rollo has to 'dispose' of the less-wilder animals, to the chagrin of their 'keepers'. But wait a minute! Do you know what sounds even shoddier than all of that, dear reader? No. Not having a conversation with the spider-wrangler, 'Bugsy' Malone (Michael Palin). That'll be just silly. It's when Rod's son, Vince (Kevin Kline), and his bootylicious companion, Willa Weston (Jamie Lee Curtis), both come into town, and attempt to do things 'their way'. OK. I'm sure you're wondering to yourself what 'their ways' entails exactly. Well, not only does Vince plaster this zoological wildlife park with a lot of corporate advertising, but in addition to this, he assigns to each animal a ghastly celebrity sponsorship incentive as well. Hey! Don't fret. I haven't forgotten about Wanda... errr... I mean Willa. Unlike Vince, she grows very fond of the zoo and Rollo the more time she spends there. Going so far as to commence a bit of monkey business as soon as she possibly can! Still. That's most probably why what next transpires begins when Rollo and his gang overhear Rod planning to sell their zoo to foreign investors. As Vince commits fraud - keepers try not to applaud - a son takes his fathers place - plus please be warned, the end of this film is a right rollicking disgrace. Now it's pretty safe to say that compared to its predecessor, 'A Fish Called Wanda', 'Fierce Creatures' is a completely different animal altogether (please excuse the obvious pun). It's not a jovial tale about two American crooks trying to dupe an English barrister into helping them find their ill-gotten gains. Instead, it's a farcical tale about a corporation taking over a smaller institution, and perverting it as they see fit. Furthermore, there are also a number of additional points I'd like to raise as well. Firstly, it was a colloquial blast seeing the likes of Ronnie Corbett and Robert Lindsay -- amongst many other members of this mostly British cast -- interact with people such as John, Jamie, and Kevin. Secondly, the message behind this film is a very appropriate one to be made in this more corporate driven day and age -- agreed? Thirdly, I noticed that this film shares a facial aspect similar to John's sitcom, 'Fawlty Towers' -- mainly because the main thrust of this story dipped and parried all over the place in that very fado-farce way. And last but not least, who doesn't like the sight of a funny monkey, huh? OK, I'm sure you can tell by what I've just said that I did like this movie quite a lot. However, to contradict this stance slightly, there were a couple of repetitive gags that didn't quite work for yours truly. Like how Jamie's character thought that John's character was a sexual deviant for example. Or how the final segment of this film didn't have an imposing sense of dread hanging over it, and played out like a rather slapstick and bumbling routine. Yep. That's right. Ironically enough: 'Fierce Creatures' didn't have a 'Fierce Ending'. Yet that is not to say that it was a bad movie. No. Not at all. In fact, if you take it as a piece on its own right, it's a pretty decent film all in all. Not as outstanding as it's predicator. Agreed. But still a very nice slice of British high jinx that's easy on the eye, and easier to laugh with. Here. Before I bugger off to the pig farm, let's have some filmic facts. (1) 'Universal Pictures' first released this comedy in England on the 24th of January, 1997. Whereas in America it was released on the 14th of February, of the same year. Eventually it made back $9,381,260 at the box-office. 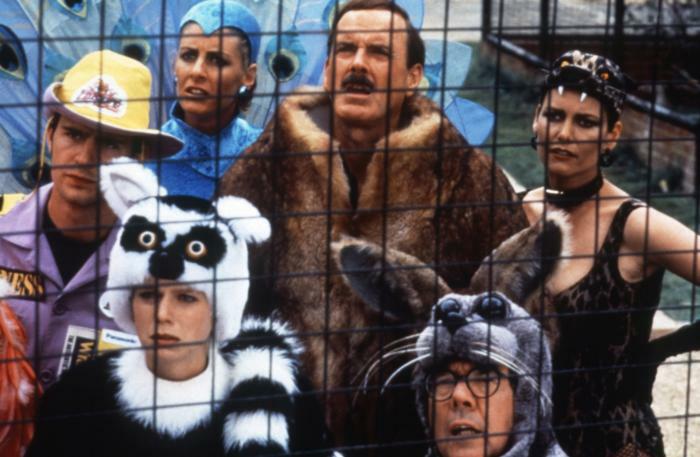 (2) This movie was dedicated to the memory of the English satirist, Peter Cook, plus Gerald Durrell, who was the founder of the Jersey Zoo seen in this film. (3) Oh! That reminds me. Whilst most of the interiors were shot at 'Twickenham Film Studios', Middlesex; plus 'Pinewood Studios', Buckinghamshire; the exteriors were shot at Jersey, the Channel Islands, and 'Marwell Zoological Park', situated in Hampshire. Also, on a side note: 'Marwell' is John Cleese's middle-name. (4) This tale was loosely based on a Monty Python sketch written by Terry Jones and Michael Palin called 'The Fierce Creature Policy'. To allude to this fact, Michael's character -- of Bugsy -- pet tarantula was named after 'Terry'. (5) Robert Lindsay's character -- of Sydney Lotterby -- was named after a BBC comedy stalwart that directed / produced such sitcoms as: 'Some Mothers Do 'Ave Em', 'As Time Goes By', and 'Yes, Prime Minister'. (6) The preview audience disliked the original ending of this jovial movie so much, certain parts of it had to be re-shot after John Cleese starred in his next film, 'Don Quiote', and after Michael Palin went around the world for the BBC produced documentary, 'Full Circle'. They didn't wait for Robert Young though. They just replaced him with the director, Fred Schepisi. (7) This film originally went by the name of 'Death Fish II', and was connected to the previous Cleese / Curtis / Kline collaboration -- 'A Fish Called Wanda' -- due to a preface written in the film's novelization, devised by Iain Johnstone, between the two characters John Cleese plays -- Archie Leach and Rollo Lee -- who are actually brothers. 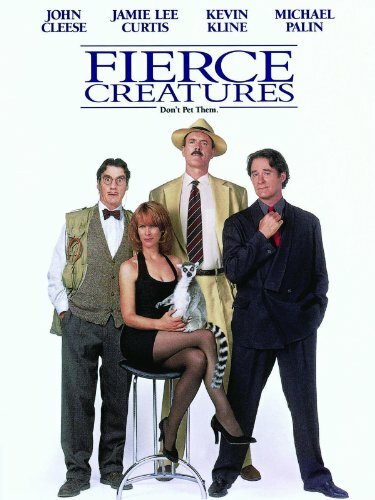 Overall 'Fierce Creatures' is a comedy of the farcical variety. The actors were great. The message was timely. The setting was fab. But the ending wasn't.